If you haven’t already noticed fall courses have been loaded in Blackboard at Valencia. 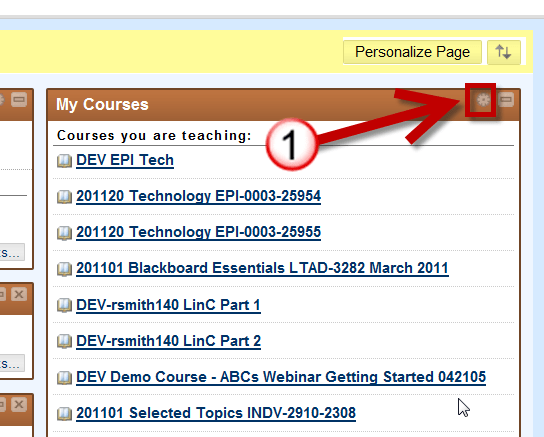 This means you are seeing past, present, and future course on your Blackboard homepage inside the My Courses module. Want to hide or rearrange courses inside this module? Follow these quick steps to edit the courses displayed in this module or rearrange the order you see them. 1: Select the sprocket from the My Courses Module in Blackboard. This will allow you to mange the settings for this module. 1: Rearrange the order in which course will be displayed in Blackboard by utilizing the drap and drop option on the left hand side of the screen. 2: Determine which courses you would like to display in the module or hide from the module, including individual settings for each course such as announcements, course name, course id, tasks, and calendar. Remember you can always go back to the settings and make changes at anytime.